We are insomniacs, book hoarders, wine tasters, occasional cosplayers, thrill seekers, oncers, ringers, collectors, gamers and explorers with a terrible sense of direction. We came, we saw....we're lost! This is the final book in the Replica duology and once again, Oliver created a unique reading experience. Two girls, two stories. 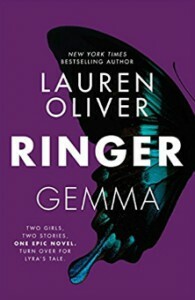 I had such success with Replica that I decided to read Ringer the exact same way, start off with Lyra's story and flip the book over every few chapters to alternate between Gemma's story. This time, however, things didn't work out quite as pleasant for me because Oliver decided to switch things up a bit. Instead of the girl's stories being very much intertwined, Lyra and Caelum are on the run while Gemma and Pete are mistaken as replicas and captured. I wasn't reading two different view points of the same story, I was reading two separate stories, which equally held my attention to the point where I would have to force myself to stop reading one side so that I wouldn't finish Lyra or Gemma's story too quickly. I didn't want to get too far ahead in either story and that was such a challenge for me. Originally I was more drawn to Lyra's story and her character, this time around Gemma really captured my interest. There was enough action and suspense on her side to keep me up until 4am finishing this book. I really enjoyed how Oliver explored the controversial world of cloning and showed various view points. "If it isn't the owning that makes humans, and it isn't the making, either, then maybe it's the unmaking?" There were some incredibly tense and creepy scenes that had me on the edge of my seat. I am so glad that I have finally been able to get back to reading after the year I've had, and this book was the perfect start.